Stephen Miller photographed DC-130A 56-0514 at an Edwards AFB Open House on 17 November 1974. The photo shows a display, with under the left wing an AQM-34M (with fuel tanks and a film reel bulge) and low drag and Paveway I Mark 82 bombs (possibly Mark 81) on the ramp, and under the right wing a supersonic BQM-34E Firebee II and an unidentified device. The DC-130 is light gray overall, possibly ADC Gray 16473. No unit badges are visible, but the unit was 6514 Test Squadron as far as Stephen remembers. Stephen Miller photographed DC-130A 56-0514 again on 20 May 1978, this time during an Andrews AFB Open House. It was owned by the 11th Tactical Drone Squadron / 432nd Tactical Drone Group (TAC badge on the tail). It has two AQM-34M's under its right wing, serials appear to be 70-1130 and 70-1157. The latter carries fuel tanks and has a film reel bulge. Craig Caston provided an Air Force photo of DC-130A 57-0497, probably circa 1960, with two Northrop/Radioplane Q-4Bs which were in test in 1960. It still has the Lockheed serial number (3204) on the nose. Note that it was still identified as an GC-130A, only after 1962 it became a DC-130A. The photo was restored from a color shifted print. 497 shows two styles of conspicuity markings applied over each other. The older scheme specified half the wings and 25% of the total fuselage length to be painted in 'insignia red' (FS 11136), unofficially also called 'arctic red'. Leading edges and control surfaces were not to be painted, and after 1957 the wings were to be painted red starting at the aileron. In 1958, fluorescent paints were introduced for conspicuity markings. To control costs, six-inch wide bands were applied to the nose aft of the radome, rear fuselage forward of the stabilizer, and wing tips. The color was ANA 634 fluorescent orange-yellow (~FS 28915), replaced by fluorescent red-orange ANA 633 (FS 28913) in 1960. The red-orange faded to orange-yellow in about 6-9 months. The new fluorescent colors were added to the old insignia-red markings if present, and 497 shows exactly this combination. Judging by the (unbleached) red-orange wingtip and lower nose section, it appears that ANA 633 was used on 497. (Source: Fine Scale Modeler, 'Hi Vis!' by Dana Bell). Craig Kaston provided another Air Force photo of DC-130A 57-0497, with the following text on the back: "NORTHROP CORPORATION'S RADIOPLANE Q-4B Supersonic Target Drone recently made its first free flight a successful one as it manouvered over the desert near Holloman Air Force Base, N. M. The sleek, 35-foot long drone, powered by a single General Electic J85-5 jet engine, streaked ahead of its GC-130A mother plane at controlled speeds up to Mach 1. The supersonic speed was reached without utilizing the afterburner with which this J85 model is equipped. Currently produced by Radioplane Division in Van Nuys, California and undergoing development for the U. S. Air Force, the Q-4B is designed to function as an aerial target for air-to-air and ground-to-air defensive systems. 10 September 1960. 0666-66-23754" Craig noted that 497 has a test boom on the starboard wingtip, and therefore it could be an earlier photo than the above color photo. Craig Kaston sent a Lockheed photo of DC-130H 65-0979, with the following release on the back: "HEAVY WEIGHT -- A Lockheed C-130 Hercules lives up to its name as it takes off from Edwards AFB, Calif., carrying on its wings four remotely piloted vehicle test units, weighing 44,510 pounds. The aircraft was modified for this mission by Lockheed Aircraft Service Company, Ontario, Calif. While no official National Aeronautical Association category exists, this is believed to be a world record for lifting external weight by a turboprop aircraft. / Newsbureau, Lockheed Aircraft Service Company (a division of Lockheed Aircraft Corporation) Ontario International Airport, Ontario, California / For immediate release / Monday, July 26, 1976". The aircraft appears to be in bare metal finish, with the rudder still painted (possibly to avoid a rebalancing job) and the nose radome support structure appears to be in primer. The 'test units' under the wing appear to be mass simulators. 'C-130 The Hercules' by M.E. Morris yields some more facts. Carl Hughes was the pilot, and a photo shows that the mass simulators consist of a large-diameter 'fuselage' fitted with 'wings' and wingtip pods. The latter are likely to simulate the moments of inertia of drones with long wings and/or external stores. They were painted red with black nose and tail fairings. Former DC-130 pilot Lou Amadio (6514th Test Squadron from 1975 to 1980) kindly provided the photos below. The first photo shows the only DC-130H, 65-0979 of 6514th Test Squadron, loaded with four AQM-34V's, most likely during the flight test program of the AQM-34V (see the AQM-34V page). The Hercules' tail markings appear to be 'USAF 50979'. The second photo shows DC-130A 57-0461 at the Targets Ramp in front of Hangar 333 at Pt. Mugu sometime in the late '80s or early 90's. The Firebee on the right pylon (left in the photo) appears to be an AQM-34M because a film reel bulge on the top of the camera section is visible. It is configured for Aegis testing (see 'Fireflies and other UAVs', page 148). The Doppler navigation nose has been replaced by a simple nosecone (Doppler radar navigation being pretty useless over water). The fuselage appears to be light gray, the wings and tail surfaces orange, and black wing tips. Rich Saulnier was with the 6514th Test Squadron from 1978 to 1980, and witnessed tests with the General Dynamics AGM-109 air-launched cruise missile. It lost the competition against the Boeing AGM-86, but became very successful as the ground- and ship-launched BGM-109 Tomahawk. The 6514th used DC-130E 61-2371 that used the call-sign 'Vespa28'. 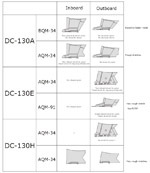 This DC-130 serial list was largely put together by Craig Kaston. It is based on Lars Olausson's self-published 'C-130 Production List' (22nd edition), and extended with data from the 1983 book 'MASDC' and its sequel from 1998, 'MASDC II AMARC'. It was further updated with information found on the web. Note that drone-carrying Hercules were designated as GC-130 until the introduction of the tri-service designation system in 1962. Confusingly, a post-1962 GC-130 is a ground instruction aircraft. A note on usage: aircraft were often swapped between Air Force units to cover shortfalls when assigned aircraft were undergoing major depot maintenance. Left MASDC on 13 March 1979 to US Navy as BuNo 570496, to VC-3 at NAS North Island (UF-496). At least in 1979 it was still in USAF camouflage, with white 'United States Navy' markings and white serial numbers. Of these aircraft, all carried AQM-34s at one time or another with the exception of 55-0021 (BuNo 158228) and 56-0491 (BuNo 158229) which never saw Air Force service as DC-130s (and carried BQM-34A, BQM-34E/F, and possibly BQM-74 targets for the Navy). RC-130A 56-0523 (c/n 182-3130) was also reported to be operated by 11TDS/432TDG. While not converted to DC-130 configuration, it may have been used as a pilot/crew trainer ('bounce bird') by the squadron, freeing up the DC-130s for drone operations. It was stored at MASDC on 6 April 1978 with inventory code CF023, later sold to Time Aviation and noted in the Desert Air Parts scrap yard in 1981. Air Classics ran an article about the end of the Avtel DC-130 operations.